The GET CR-0270-BK salad crock holds up to 2.7 quarts of product for replenishing salad bars and prep tables. Its black color blends with most décors. 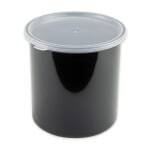 The GET CR-0270-BK salad crock is made from SAN plastic to withstand heavy use in commercial settings. The crock is easy to wash since it is warewasher safe.